Beef and beer stew – carbonnade a la flamande – is all about the beef, the beer and the onions. Browned beef. Caramelized onions. Brown Ale. A little bit sweet from the sugar. A little bit sour from the vinegar. A little bit smoky from the bacon. Everything in balance. Delicious. Beer and beef stew is slow food. Weekend food. Food to impress if you take time and care. Brown the feef in batches. Really cook the onions. Like you’re making French onion soup. A good stew is dinner party worthy. And beer and beef stew is good stew. You want the onions to melt into the final sauce. Take 30 minutes or more for this step. Once you’ve done that you are on auto-pilot. Cover your pot of stew and stick in a 325F oven and wait. For a couple hours. Maybe check in once in a while to make sure there’s enough liquid. That’s the beauty of stew. Do work up front, then sit back and relax. Invest up front and you’re sure to get something wonderful at the other end. If you take one thing away from this recipe, make it that browning beef takes time. The beef will throw liquid as it cooks. If you’ve ever browned beef for stew you’ve seen it. 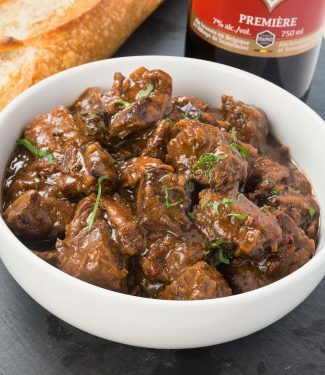 If you overcrowd the beef, it will cook in the liquid. That’s boiled beef. And that’s a shame. You want brown. Brown tastes good. Look up Maillard reaction. It’s critical to cooking. Leave at least a quarter inch between all the pieces. Work in batches. You will get browned beef. Don’t do this and you will get boiled beef. 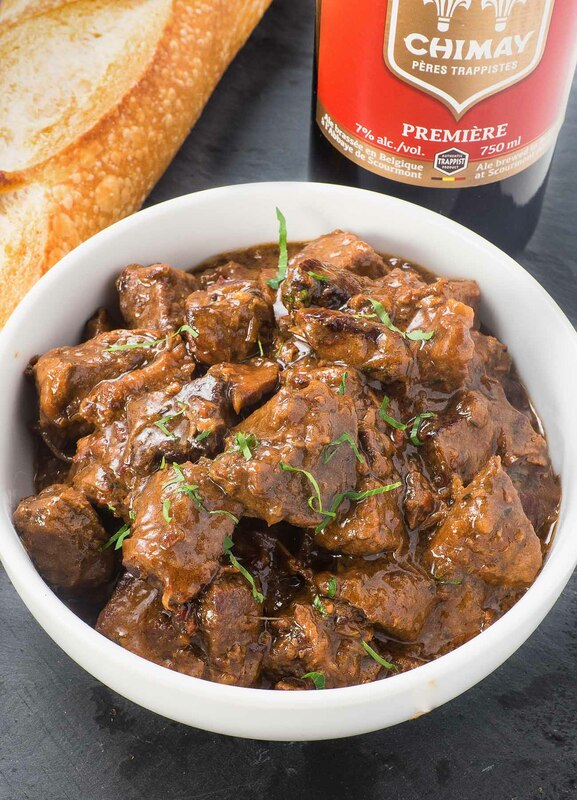 Serve beef and beer stew – carbonnade a la flamande with boiled potatoes and carrots. Or with good crusty bread and a green salad. Or even with mashed potatoes. Stew with mashed potatoes. Comfort city. Serve it to good friends. Eat. Drink. Enjoy. This is Belgian beef and beer stew. It's all about beer, beef and onions. Take your time browning the beef and cooking down the onions. It's totally worth it. Vegetable oil as required to brown the meat. Chicken stock as required to cover the beef. Heat a large dutch oven over medium low to medium heat (you will need to find the browning sweet spot). Add 2-3 Tbsp of oil to the dutch oven. Working in batches brown the beef well. Be careful not to overcrowd the pan. If you get a big puddle of liquid in your pan, it's overcrowded. You are boiling your beef. That's bad. It took 5 batches in a 6 quart dutch oven for 4 lbs of beef. Dice the bacon into 1/4 inch pieces and add to the dutch oven along with the leftover oil and goodness. Cook to render the fat and add the thinly sliced onions. Add a bit of salt and cook, covered, for 20 minutes. Stir occasionally. Uncover and cook another 10 minutes. You are going for meltingly tender onions. Think French onion soup. It may take a little longer but it's worth it. Add the crushed garlic and flour and cook another 2 minutes, stirring well. Mix the mustard with a little beer to dissolve. Add about 1/2 cup of the beer and scrape up any browned goodness on the bottom of the dutch oven. Pour in the rest of the beer, along with the mustard, cider vinegar, brown sugar, bay and fresh thyme. Add a bit of fresh ground black pepper as well. Return the beef to the pot along with any accumulated juices. Add just enough chicken stock to cover the beef. You may not need any at all. Add a good tsp of salt at this point, cover and place in a 325F oven for about 2 to 2 1/2 hours. This is traditionally served with boiled new potatoes and carrots. I like it with a green salad to start and crusty bread. Romain, I think you are totally crushing it with your photography skills! That looks amazing! Thank you Elizabeth. I’m having fun learning! This looks like the perfect comfort food where the time to do it right really pays off. Nice and thick and developed…I can’t wait to try this one! The way the onions melt into the sauce really does make it comfort food. Hope you like it. I’m sure the time and care you take to brown the meat without crowding results in a most delicious and flavorful stew. I must remember this technique, I always get in a hurry and don’t want to take the time it takes to brown the meat properly. Thanks to you, I now know why this is so important! Thanks for yet another very informational recipe, I can’t wait to impress my family with this amazing looking beef stew! Browning the meat is probably the most important step. 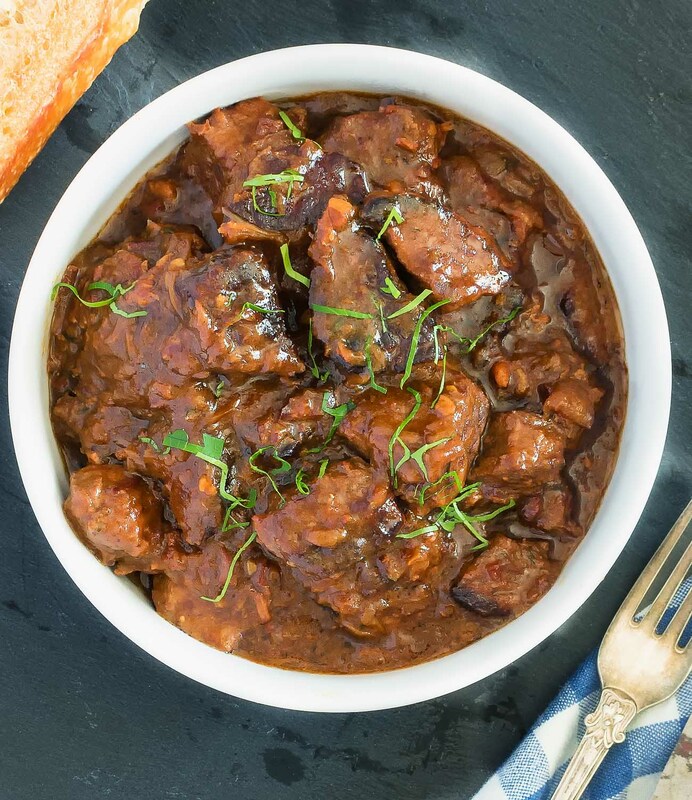 It’s called the Maillard reaction and it contributes a tremendous amount of flavour to any stew. Think about the difference between boiling a piece of chicken and pan frying it. Exactly the same. Your website has given me so many great ideas for beef! We have a freezer-full here we bought from a local rancher, so keep those beef recipes coming please! :) This looks so flavorful and comforting, perfect for a cold spring day. Pinning for later! Love that you get your beef locally. I hope you find the recipe worthy! Beef, beer, and onions– what could be better? This stew looks so flavorful. It reminds me of my mom’s homestyle beef stew recipe, but with punched up flavors! Can’t wait to try it! Beer, beer, onions, and bacon! The pictures look amazing! By taking the time to brown the beef and cook down the onions, the flavours must be rich and so flavourful! Thanks for sharing! Taking your time and cooking down the onions really makes a difference. There are no shortcuts for this recipe. Good recipe, a few suggestions/modifications that are traditional are that the mustard is spread on a piece of brown bread and placed on top of the stew and allowed to dissolve. The bread acts like a thickner so no need for flour in the recipe. For the sweetness, you can use sugar, but I prefer using either currant jam (traditional) or snipped prunes (my personal favorite), which both dissolve into the stew and add a rich sweetness. When ordered in Belgium, Stoofvlees (Flemish version of the French Carbonade Flamande) you typically get this served with frite (Belgian fries), but any potato works well. Thanks for the recipe, it truly is comfort food for a Belgian! Thank you so much for this incredibly thoughtful and helpful comment. I love the idea of prunes instead of sugar especially! It was amazing. I suspect the beer makes a big difference because I could definitely taste the Belgium beer used. Also, the stew was good fresh, but I actually liked it better the next day. Glad you liked it. I do think the beer does make a difference so it’s worth seeking out.